Before the ones you probably know better from ww2, the Scharnhorst and Gneisenau has been Imperial Navy’s most recognizable and famous German cruisers. 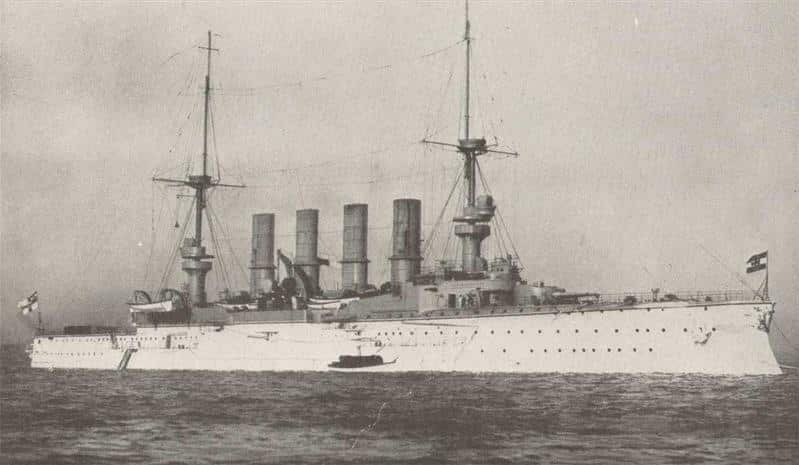 Named after famous Prussian generals during the Napoleonic wars, they had been were the ultimate and very best German armoured cruiser, at the end of their lineage, just before the first battlecruisers came out (1906). They had been ordered at Blohm & Voss and Weser shipyards in 1905, launched in March-June 1906 and completed in 1907 and 1908. Much inspired by previous Roon class of 1903 they retained their general appearance. However, they were much larger, better protected and better armed, thanks to the choice of giving them a new battery of eight 210 mm in turrets and barbettes. They were designed specifically to successfully oppose their British equivalents, also end of their line, the Minotaur and Shannon. The Roon class was in many ways similar to the Scharnhorst class. 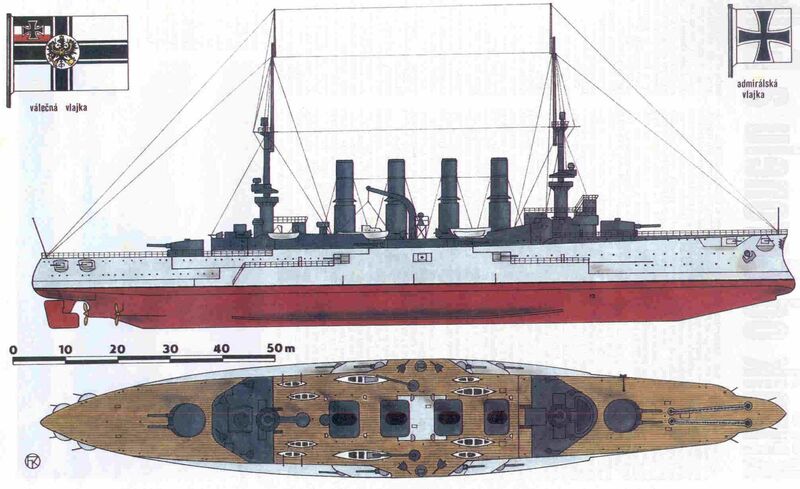 Both ships had a Krupp armor belt, 150 mm (5.9 in) thick (center), decreasing to 80 mm (3.1 in) on both end of the citadel, down to nothing on ends, and backed with teak planking. The deck was protected from 60 mm (2.4 in) to 35 mm (1.4 in) and it sloped down to the belt at 40–55 mm thick. Forward conning tower was 200 mm (7.9 in) with a 30 mm roof. The rear one was 50 mm only with a 20 mm roof. Main battery was 170 mm (6.7 in) with 30 mm roofs. 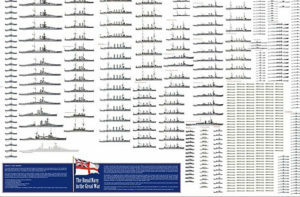 Amidships guns had 150 mm (5.9 in) shields and 40 mm roofs. The secondary guns had 80 mm shields. The machinery was globally the same as the previous Roon class: Three 3-cylinder triple expansion engines, that drove a single propeller each. 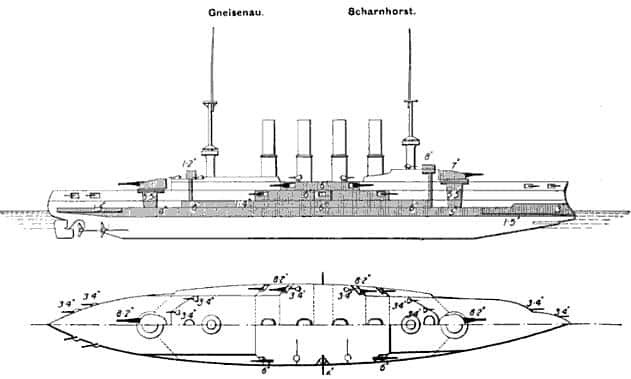 Gneisenau’s screws were slightly smaller than her sister-ship. The engines were fed by 18 coal-fired marine-type boilers, and 36 fire boxes. Total output was about 26,000 metric horsepower (19,000 kW; 26,000 ihp), but on trials bot ships achieved higher speeds at 28,782 ihp for Scharnhorst and 30,396 ihp for Gneisenau. Scharnhorst topped 23.5 knots and Gneisenau reached 23.6 knots (43.7 km/h; 27.2 mph). Both carried 800 t of coal but had a maximal storage for 2,000 tin case of war. This made for a 4,800 nautical miles (8,900 km; 5,500 mi) radius at about 14 knots (26 km/h; 16 mph). Their electrical plant was made of four turbo-generators for a total of 260 kilowatts at 110 volts, the last time this voltage was used. In the next Blücher, generators were rated at 225 volts. Jane’s diagram of the class. The main armament of these ships was equivalent to the interwar heavy cruiser standard, with eight 210 mm (8.3 in) SK L/40 guns. There were two main turrets fore and aft, and four under single wing turrets at each ends. 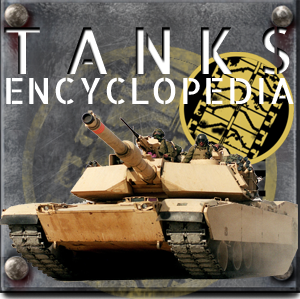 Projectiles were 108 kg (238 lb) armor-piercing shells flying at 780 metres per second (2,600 ft/s). The guns achieved a 4–5 rounds per minute, and 700 rounds were carried total. With a 30° elevation, these guns achieved a 12,400 metres (single turrets) to 16,300 metres (17,800 yd) range. Secondary armament comprises six 15 cm (5.9 in) SK L/40 guns in casemates, capable of 4-5 rpm, with 1,020 rounds in storage. With 20° elevation they were capable of a 13,700 metres (15,000 yd) range. Their tertiary artillery, quick-firing for anti-torpedo warfare, comprised eighteen 8.8 cm (3.46 in) guns in casemates, firing 10 kg (22 lb) shells at 620 m/s (2,000 ft/s). There was a total of 2,700 rounds in store, and they can fire at 11,000 m (12,000 yd). There were also four 45 cm (18 in) submerged torpedo tubes, launching a C/03 type torpedo. The latter carried a 176 kg (388 lb) HE warhead at 31 knots (57 km/h; 36 mph), and a range of 1,500 metres (1,600 yd). 11 torpedoes were carried. Of little use in the Hochseeflotte against because of the profusion of faster, modern battlecruisers, they were transferred to the Pacific squadron under the command of Von Spee, with whom they were going to forge a true legend. In 1909 they were based at Tsing-Tao. 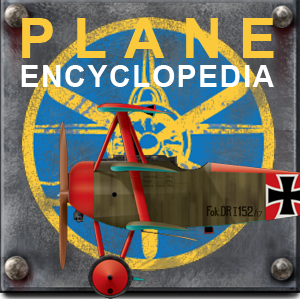 With the outbreak of the war and the entry of Japan into the central empires, their place was no longer secure, and the squadron began to wage war on commerce in the eastern Pacific and on the coast West of South America. The following is known: The only possible pitfall in the Cape Horn area was Admiral Cradock’s squadron, based in the Malvinas Islands. The latter had no choice but to face his rival with inferior forces, in order to forbid him to cross the Atlantic. The clash took place at Coronel on Nov. 1, 1914. The Good Hope and Monmouth were sunk there, while the Germans took almost no damage. The squadron passed Cape Horn and found itself harassing convoys from Argentina and Brazil. But a British force was quickly assembled to track down Von Spee. The latter had to fight the awaited return battle on 8 August 1914 off the Falklands. Faced this time with battle cruisers, the Scharnhorst and the Gneisenau stand little chance but fought with gallantry. 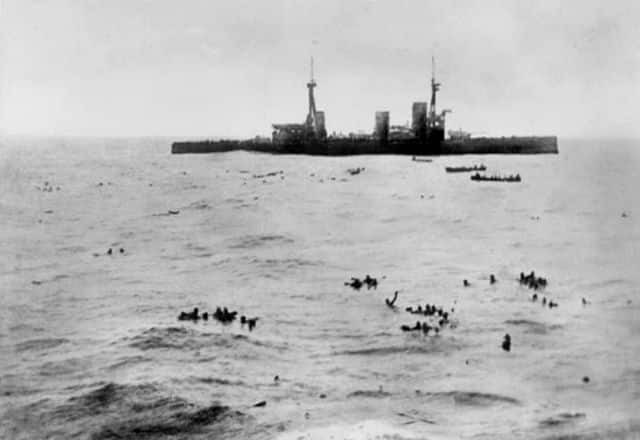 Both were sunk but their crew was partly saved. 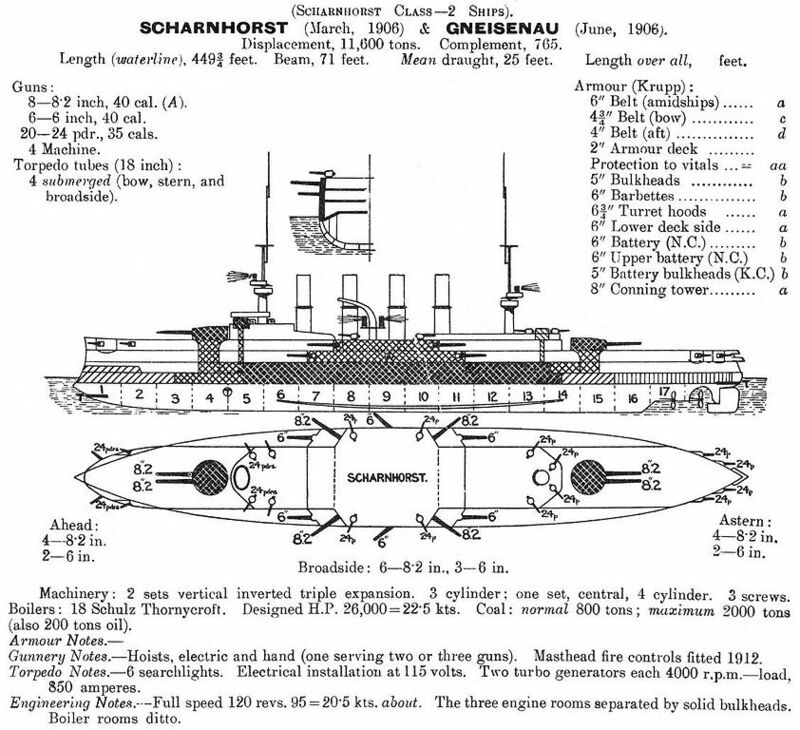 Two views of the Scharnhorst type. 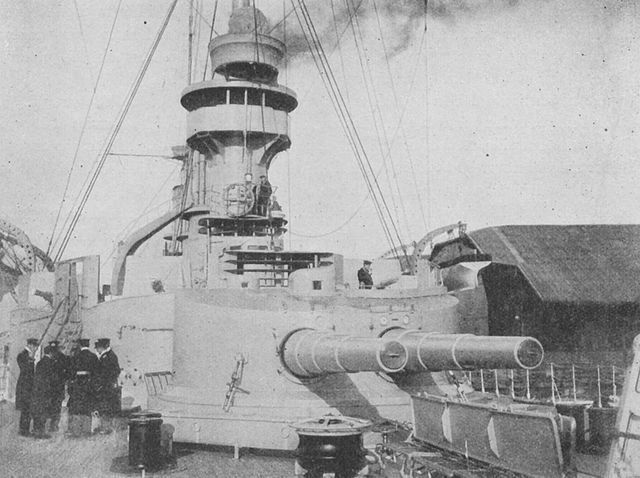 Generalleutnant Gerhard von Scharnhorst laid down at Blohm & Voss, Hamburg on January 1905 was commissioned on 24 October 1907. She was Admiral Maximilian von Spee’s flagship at the German East Asia Squadron. Her crew was esteemed one of the best trained, and like her sister-ship, she won awards for their excellence at gunnery. The declaration of war caught her in the Caroline Islands on a routine cruise. 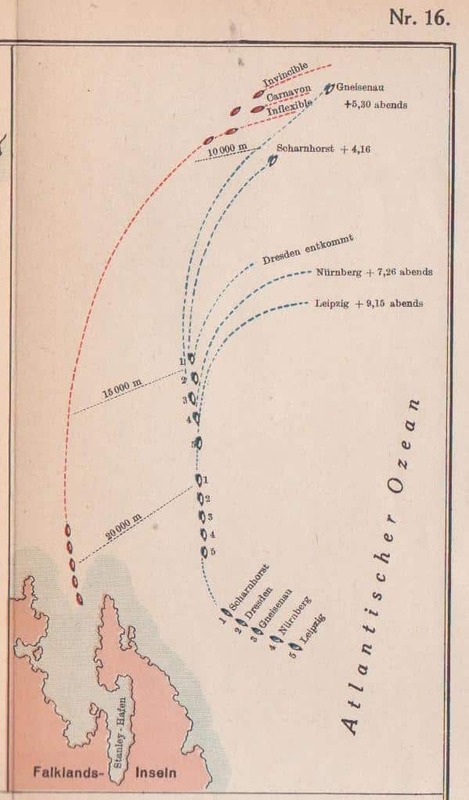 Japan’s declaration of war soon convinced Spee to depart from Asia, and join Leipzig and Dresden from the American station, and heading for Chile to refuel. The goal was then to return to Germany via the Atlantic Ocean. However en route he planned also to attack shipping and get rid of Admiral Christopher Cradock’s squadron. 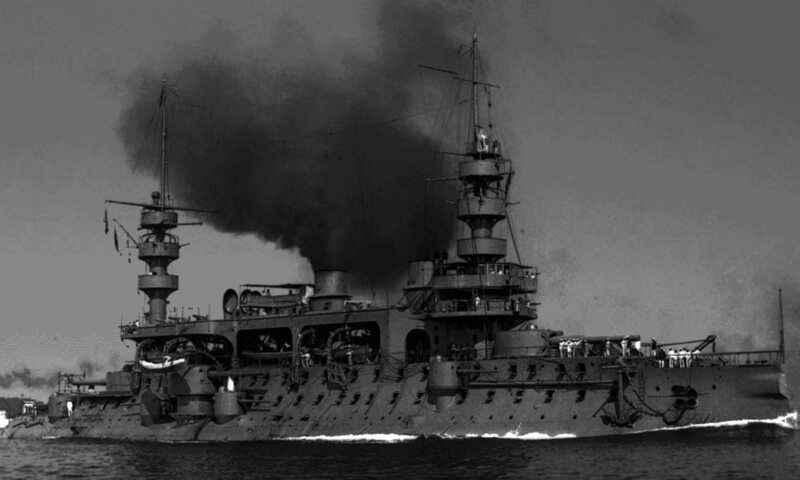 On 22 September, the Scharnhorst attacked Papeete but declined taking the coal stockpiled in the harbor by fear of mines, the coal being burnt anyway in the end. On 1st November 17H PM, Von Spee’s squadron met Admiral Cradock fleet off Coronel. 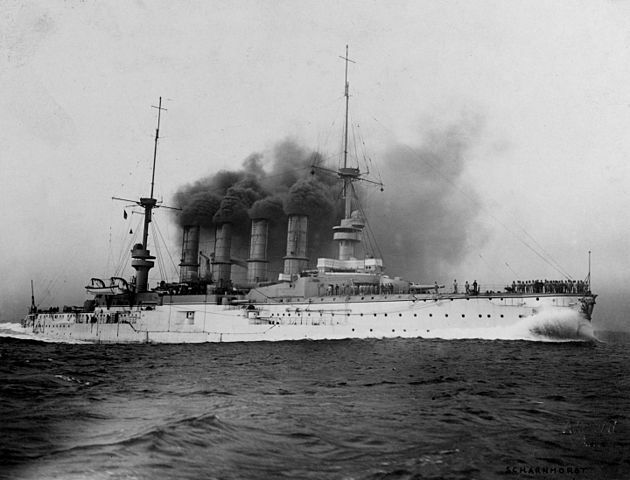 The German armoured cruiser excelled in this battle, engaging British cruisers at 18 kilometers, then closing to 12 km at about 19H PM. She scored 34 hits on the HMS Good Hope, at least on landing in the ship’s ammunition magazines, which detonated. 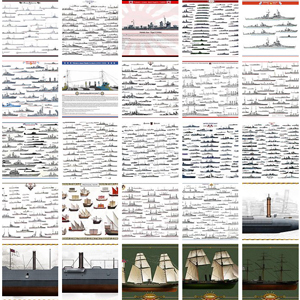 The rest of the British ships escaped by the favor of night. While the result was perceived by the First Lord of the admiralty as “the saddest naval action of the war”, the Kaiser ordered 300 iron crosses for the crews upon return. Scharnhorst sinking, with the Gneisenau behind. However the squadron’s next objective was to destroy the Falklands island radio station after refueling in Valparaiso. 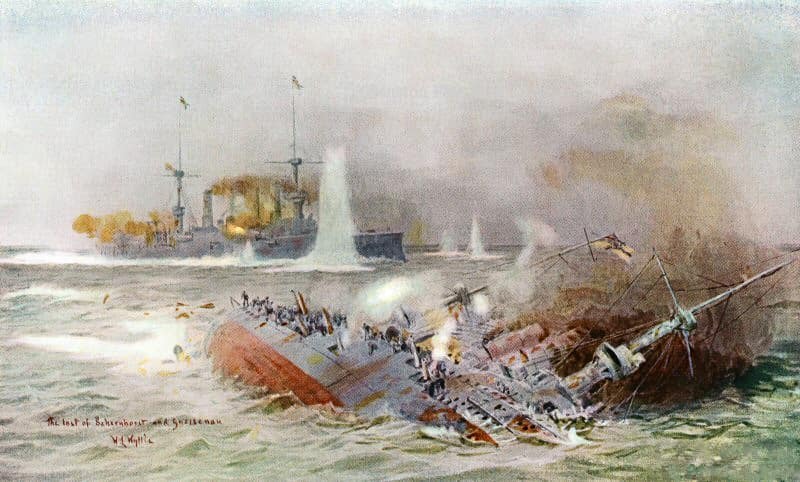 Meantime Fisher ordered Admiral John Jellicoe to detach battlecruisers Invincible and Inflexible to catch and destroy Von Spee, under the orders of Vice Admiral Doveton Sturdee. The squadron also comprised cruisers Carnarvon, Cornwall, Defence, Kent, soon reinforced by the light cruisers Bristol and Glasgow, escaped from Coronel. They arrived at the Falklands by the morning of 8 December, spotting the Germans at 9H40 AM. HMS Inflexible picking up Scharnhorst’s survivors. In turn, Von Spee also spotted them and ordered a retreat. However the worn out ships could not escape the fast battlecruisers, that catch them at 13H20, opening fire at 14 km (8.7 mi), and not ceasing until 15H00, leaving the Scharnhorst a burning wreck, riddled of dozens of 305 mm impacts, listing and later sinking rapidly. Gneisenau was hit too, by no less than 50 rounds, and sank rapidly, her crew cheering the kaiser before going down. Although hundreds of survivors were picked up, some 2,200 men perished, among which Admiral von Spee, that became a tragic national hero back in Germany. His memory would be revived through a pocket battleships, one of the three Deutschland class, which also operated in the South Atlantic, while both cruisers would be revived in the next class of German interwar battleships.